Offering a new level of inner peace for all Spey fishers. Some days of casting with a Spey outfit are easier than others. Days when you get a lot of tangles in your shooting line are never easy. Casts which produce balls of knitting jammed up against your first stripping guide impair your concentration and pretty quickly, other facets of your casts suffer as well. Most Spey casts involve circular motions with the rod, which have a habit of twisting the line. Some types of casts may put a full revolution of twist in your line each cast. As you work down stream through a piece of water, possibly fifty or more revolutions in your line may result. Pretty quickly, your shooting line is so twisted that executing a cast without tangles becomes nearly impossible. There are several methods used for untwisting a Spey line. Undoubtedly you have your own. Some while back, Josh Linn decided to eliminate the problem altogether. After a lot of trial and adaptation, Josh perfected a way of installing a small barrel swivel between the shooting head and the shooting line. This eliminates line twist and makes tangles in a shooting line virtually a thing of the past. Josh has moved on, but we still think the Spey Swivel idea is a good one. Currently, Tony Barnes is making all of our Spey Swivel set-ups. Tony has taken the Spey Swivel to a whole new level by applying new technology and new materials to produce a better product that works smoother and lasts longer. They still incorporate very small, but very strong, high quality swivels, and lots of attention to detail during assembly. This is the second generation Spey Swivel, or Gen-2. 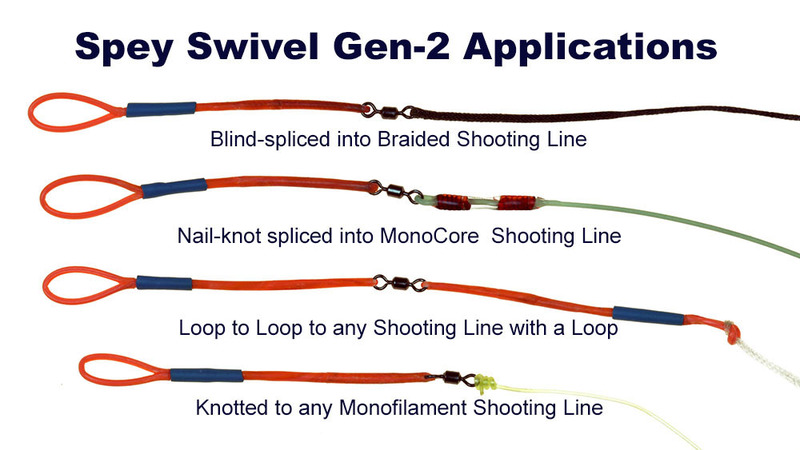 My prediction is that the Gen-2 Spey Swivel will be the most copied Spey innovation of the next 10-years, because if you don't have one in each Spey line, you will have tangles. No one wants more tangles. The Gen-2 Spey Swivel is the best answer for reducing tangles caused by line twist. For some running/shooting lines, remove one of the loops from the swivel by cutting it off with a pair of scissors. Then run the shooting line directly through the bare loop on the swivel. To form a connection in braided shooting lines, such as Scientific Anglers PE Shooting Line or Airflo Miracle Floating Shooting Braid, a blind splice loop is the smoothest and best connection. For most fly line type shooting lines that don't come with a loop installed, insert the end of the shooting line through the open loop on the swivel and install two nail knots for 15-pound mono to secure the loop. Coat these knots with Zap-A-Gap and let dry naturally so that the glue penetrates and coats the loops smoothly. For many fine diameter monofilament shooting lines, simply connect it to the open swivel loop with an improved clinch knot. I saw Mr. Bachmanns information on these a few years ago and tried them . I haven't regretted it. The twist that can occur while working down a long run can affect the way a fly swims and how a line cast. Placed between your running line and the head can greatly reduce this. Except for a soft click when reeling in, I don't even know they are there. The 2nd gen swivels are even better made and I have been please with them on my rig.